You have been charged with the task of printing your online directory. Naturally, the first place to go for information is an online search. One quick internet search brings up mind-boggling choices of paper quality, printing, and binding options. Where do you start? Ultimately, what drives your decision is your budget and purpose for the printed directory. This will determine your paper quality, cover grade, printing means and options. Before printing, think about the purpose of the directory. Is this a directory that will be referenced frequently or do most of your members utilize an online directory? Is this a directory to be used for prayer requests, with people jotting down notes by names or is this a once-every-5-years directory? If you do not have an online directory and the printed directory will be the primary means for members to contact each other, then you will want to choose a higher quality paperweight and cover grade for durability. 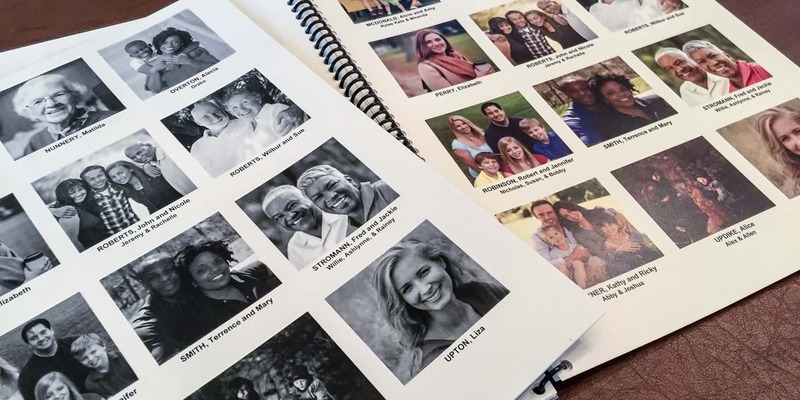 If your church utilizes online access and mobile apps, and the printed directory is a secondary means of communication between the members, then you can utilize cheaper printing options. There are three options: print in-house, use an online printing company or use a local printing company. There are a host of other printing options to decide once you have determined how to print the directory. Taking some of the guesswork out of the process, we have evaluated various options for you, listing the pros and cons of each. Printing can be expensive. Remember there is no one solution for everyone-choose the option that best meets your church’s needs. If the purpose of a printed directory is a secondary means of communication for your members and your church has a copy machine, then printing in-house is the cheapest way to print. Or, if you plan on printing a completely new directory every several months to accommodate the updates, then printing in-house is a good option. Of course, the quality of your copy machine will determine if this is the right choice for you. Typically, this will not produce a professional looking directory, but it will produce a quality directory that will meet your church’s needs. Online printing companies are options for those who are somewhat familiar with computers, printing choices and different paper and binding choices. What I quickly learned about online printing companies is that the more I read, the more questions I had. I didn’t know the ‘lingo’ to correctly submit a printing order. There is there is no one standing physically by me to walk me through the process. It is almost impossible to find an online printer who will print a small quantity. ⦁ Impersonal. I discovered that I needed to have a basic printing knowledge before attempting to submit a job. Although chat boxes were available, there was no one to ask questions to face-to-face. ⦁ Minimum print quantity/dollar amount. Some of the online publishers had a minimum print quantity of 25 and others had a minimum dollar amount. ⦁ Difficult to make changes once the job has been submitted. A relationship with a local printer is the easiest path to quickly printing a professional looking directory. Two printing companies- Fed Ex and Office Depot/Office Max- were testing. Both of these options are readily accessible in most cities in the United States. First stop, the local Federal Express store where I could speak with a representative. Not only did he give me an education on printing, he also showed me the different printing options, paperweights, binding and cover choices. Being able to ‘see’ and ‘touch’ the options was very helpful. He also helped me ‘think out loud’ and offered solutions. A second sample directory was printed at Office Depot. The printed product from Office Depot was very similar in quality and price to Federal Express. However, Office Depot did not have the same printing knowledge as Federal Express. ⦁ The local printer has the expertise and can offer suggestions and solutions. ⦁ Typically, local printers have a quantity discount (Both Federal Express and Office Depot offer quantity discounts). ⦁ Both Federal Express and Office Depot/Office Max offer promotional coupons throughout the year. ⦁ They are fully stocked with multiple paper options. Printing can be expensive. Make sure you understand all the options to stay within your church’s budget. Coil binding gives a professional look, but pages cannot be added for updates. So, choose a coil bound cover for those once-every-five-10-year directories. Choose plastic or cardstock for covers. If choosing a plastic cover, spend the extra money (usually under $1.00) for a thicker cover. Fed Ex has a frosted option that does not show fingerprints and you can still see the cover page through it. Choose a heavier cover for durability. Outside of stapling the upper left corner, saddle-stitching is the cheapest binding. Do-It-Yourself Binding, using report covers, is very economical. This may require using a 3-hole punch for each directory, but it allows for easy updates. Be sure and use a clear report cover so that your directory’s cover page can be seen. Printers love PDF’s. Bring the directory to the printer in a PDF file. You can email the PDF or bring a flash drive. The Instant Church Directory generates as a PDF, so no file conversion is needed. As you can see, there are many different options for printing your directory. Choose the option that best meets your church’s needs and budget.